Concepts-based teaching and learning is the right thing to do for kids. Effective comprehension and thinking require a coherent understanding of the organizing principles in any subject matter; understanding the essential features of the problems of various school subjects will lead to better reasoning and problem solving. – Brandsford, Brown, & Cocking. How People Learn: Brain, Mind, Experience and School. (Washington DC: National Academy Press, 2000), 238. Sure we can gets kids talking and thinking about concepts – but how do we make sure that thinking is going to lead to sophisticated understanding? The great news is that we did a little unintentional experiment. We created a lesson asked learners to hypothesize the relationship between time and identity and then refine/revise that hypothesis based on two different poems (that provided different ideas about the relationship between time and identity). We did the lesson first with teachers and then with students. Teachers came to more sophisticated understanding of the relationship between these concepts than students did. Not surprising you say. Let’s dig a little deeper. We asked ourselves why did that happen? 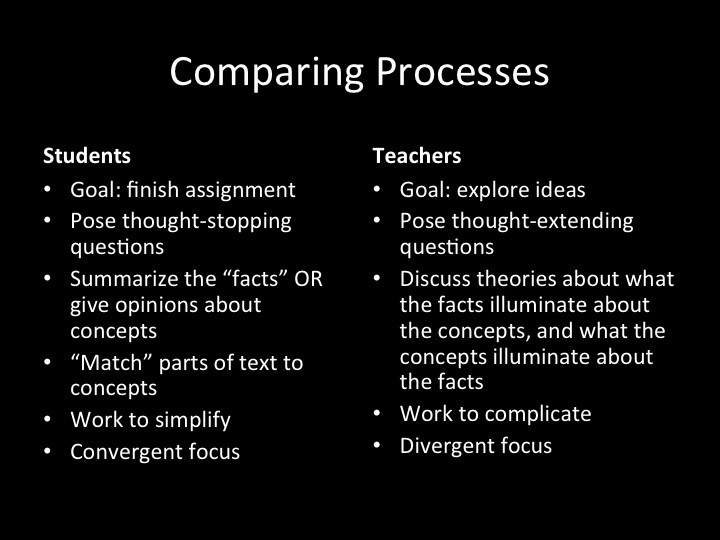 We knew the end points were different, but what had been different about the steps the teachers went through vs. the steps the students went through. (More on this idea about comparing processes instead of products to come soon!). Here’s a quick summary of our thinking. So the next step is asking the really tough question: how do we shift the process students went through to align it with the moves we know will lead to more sophisticated understanding? Like I said, not easy, but the right thing to do. Share your thoughts! We need everyone’s brain on this question!